Since 1973, San Jose Taiko has been mesmerizing audiences with the powerful, spellbinding, and propulsive sounds of the taiko. Inspired by traditional Japanese drumming, SJT performers express the beauty and harmony of the human spirit through the voice of the taiko as they weave traditional Japanese sounds with the beat of world rhythms. 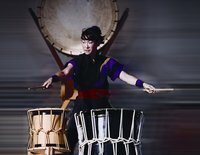 At San Jose Taiko, Japanese, African, Balinese, Latin, and even American rock and jazz merge to produce an innovative contemporary sound that transcends cultural boundaries. San Jose Taiko will also present a special performance for area schoolchildren while they are in Athens. San_Jose_Taiko . Last modified Nov 14 2011 3:09 p.m.